Through synthesizing disparate strands of literature over the period 1992–2016, this chapter identifies past and current research about the institutional context shaping entrepreneurial activity and its effect on economic growth. This conjoint analysis reveals two important research lines in entrepreneurship research, which have been devoted to explore the institutional antecedents and consequences of entrepreneurial activity. Our findings try to reveal a broader comprehension of these two separate lines, providing an analysis of the interaction between institutions, entrepreneurship and economic growth. 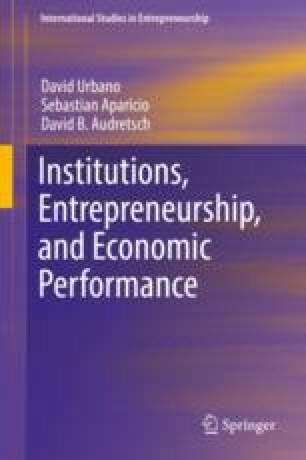 The systematic literature review suggests that institutions could be related to economic growth through entrepreneurial activity, which would open new research questions about what institutional factors encourage entrepreneurship rates in order to achieve economic growth. Possible theoretical implications may be discussed not only in terms of the importance of entrepreneurship, such a key element in economic growth, but also in terms of economic development, such a complex process in which entrepreneurial activity, influenced by institutions, is involved. Another version of this chapter has been published in Urbano, D., Aparicio, S., & Audretsch, D. (2018). Twenty-five years of research on institutions, entrepreneurship, and economic growth: What has been learned? Small Business Economics. In Press, https://doi.org/10.1007/s11187-018-0038-0.